Situated in a well maintained gated development with communal gardens this well proportioned studio flat benefits from a recent refurbishment and is set in a period conversion moments from vibrant Portobello Road. Pinehurst Court is positioned within moments from Portobello Road and the fantastic restaurants, shops and bars of Westbourne Grove and Notting Hill. 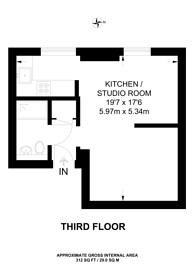 312 (28 Sq M) approx.